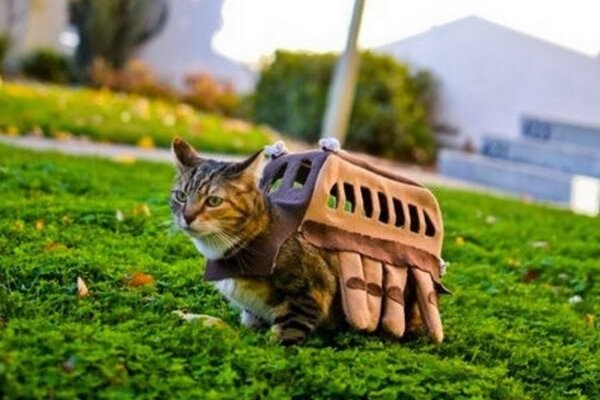 Ghibli Blog: Studio Ghibli, Animation and the Movies: Turn Your Pet Into a Cat Bus! Turn Your Pet Into a Cat Bus! Now this is delightful. I can't help but imagine that whoever markets and sells one of these cat costumes would make a fortune. Quick, move quickly! Before someone else beat ya to it! Every cat owner will want one of these! Seriously, somebody needs to sell a line of Cat Bus coats. Hurry up and make it happen before I convince Marcee to do it, and we hog the market all to ourselves.